"Local is no longer a geographic term," said Monique Manso, Publisher of People en Espanol who moderated the panel, "The Local Connection" at #PORTADA13 Regarding the Hispanic market, "passion points inform content and distribution channels." It is important that brands entertain and provide service or consumers will curate content outside of their messaging streams." Finally, she said that a "reflexive scale gives national efforts local legs, and local effort national impact." Social media drives the scale of live events, which can be significant. In one case, a brand organized a local market event with national impact which became a national movement. A localized message can reverberate on a mass scale, Manso said. Manso highlighted that now more than ever, brands are contributing value to consumers through tools like custom video content. In addition to traditional information such as articles, Hispanic consumers want video and behind the scene cover stories, which she characterized as "hidden content." Historically, providing additional content was expensive. But with an in-house video department and partnerships, her company has succeeded in filling that market need. The print and online reach of Time Axcess was 136 million unduplicated users, including 34 million multi-cultural. Of that, 23.9 million were Hispanic. "Is there anything more important in life than love," asked Ryan Barker, EVP Marketing & Decision Analytics at Vision Critical, which studied 4000 brands across different categories. He said that in the Hispanic market, two out of three brands aren't loved. An emotional connection to brands by consumers has implications at the local level. Equating brand development within a certain segment with a love relationship, Barker said that brands that target the Hispanic community should ask: "what is your current relationship? What stage of development are you in? Measure four critical ingredients: well-regarded, cognizance, competitive uniqueness, true meaning. "What drives two thirds of brand values in the Hispanic community is competitive uniqueness and meaning" Brands that are perceived as competitively unique and who have a strong meaning within a community have a strong change of developing future bonds with that segment. "Average emotional connection needs to be 2.3 times stronger for Hispanics than in the anglo-marketplace," he said. In segment audiences on their stage of development, brands should ask: "what is the primary lever of dating that leads to love? Should pricing power be the same for Hispanic market as Anglo market? Nothing will ever replace a real time dialogue. You can have a real time dialogue with consumers, with Hispanics, with analytics on a real time basis." Regarding specific strategies for reaching the Hispanic market, each presenter's approach varied according to brand. 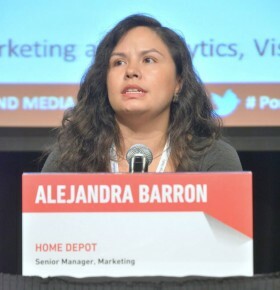 Alejandra Barron, Senior Manager of Multi-Cultural Marketing at The Home Depot said "we look at different competitive mix by region markets and seasonality. We have dual targets: consumers and professionals, and the seasonality of their business." Having a one-on-one relationship (through the use of tools like surveys) with customers was Home Depot's strategy for understanding their customer base. "With 2/3 of Hispanics living in six states, we look at our strategy like the elections," said Lizette Williams, Senior Brand Manager of Multicultural Strategy at Kimberly Clark, "we have to win six states and we have category leadership." To market Huggies, "we look at births, where babies are being born. Fifteen hospitals in US drive most births in the US. Williams focuses her efforts on a miles radius around each hospital. In addition, her approach combines Hispanic and general market data. One study revealed that Hispanic Mothers were unhappy with the lack of spaces to changes their babies' diapers. Huggies set up changing stations at local events, providing consumers with diapers. The consumers expressed their satisfaction on social media and digital, and the campaign was considered a success. Christopher Rivera, Associate Director of Brand Marketing Multi-Cultural, Kellogg Company, said that Kellogg built a data foundation in each of the most important US markets. He said that data allowed the brand to see important differences in each market and demographic. For marketing Special K cereal, a study of Hispanic women in LA, Chicago, Miami, and Houston revealed that women in different regions had different approaches to weight management. In Chicago, weight management was seasonal whereas in Miami, it was year-round. Understanding the nuances in the Hispanic market helped Kellogg position itself as one of the leading brands among Hispanics. Regarding ROI, both presenters and participants lamented that ROI is inadequately measured in the Hispanic market. Williams said, "ROI is like looking in the rearview mirror backwards. But we have to look to the future. Hispanic ROI's are lower, but they're inaccurately calculated because it's based on the Spanish-speaking segment. It's important to look at forecasts, at the population. We have look at authenticity and time. Barker said that in studying the Hispanic market, brands should focus on psychographic or behavioral differences among consumers. "How do you justify brand contributions when you're only looking at volumetrics?" Rivera added that "we've challenged our agency plans to think differently. What are we going to do differently? Be more visual with our packaging? How do you maintain it? We have a national partnership with Major League Baseball. We hired Latino legends for appearances. Now it's a total market approach. Now it's the number two brand with Hispanic households in the US. In New York, partnered with the New York Yankees and Bernie Williams." According to Barker, examples of brand excellence are Walmart, Best Buy, and Subway. "At the local level are their ability to adjust to seasonality, catering to regional tastes, and understanding underlying values and goals of their customers." Barron added that "stores build the footrprint at the local level. Events like do-it-yourself workshops can be reflective of the composition of the local market." The key is to build awareness and consciousness of the community. Manso concluded that "making the community inclusive is a key motivator for our audience."